It's very easy. Simply register the first time you use the service and that's it. You can log on from any computer, mobile or tablet - whenever you choose. A full list of treatments are displayed with your choice of therapist and their availability. If all the availability is taken, leave your details anyway and the booking system will contact you in the event of a cancellation. 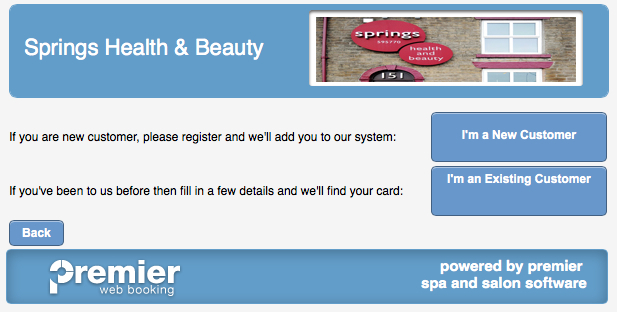 Springs Booking ONLINE also provides clients with the ability to pre-pay using PAYPAL! BOOKMARK the page using the symbol on your phone to use as Booking App.